In 1994, KFC in Florida had the Area Coaches handling the research for local locksmiths and their services for the restaurant locations under their area. This led to the KFC management teams to spending a significant amount of time looking into this one aspect for locations that only absorbed a very small amount of time that occurred at a location, and only on some occasions. This took away company resources from KFC by having this solution in place. The Senior Facility Leader over Florida decided to begin looking for a one source solution that would remove all of the one-off vendors and invoicing that KFC was experiencing. To alleviate this burdensome duty for the Area Coaches, KFC looked into the single source solution. During this research they were introduced to InstaKey Security Systems’ Key Control Program. 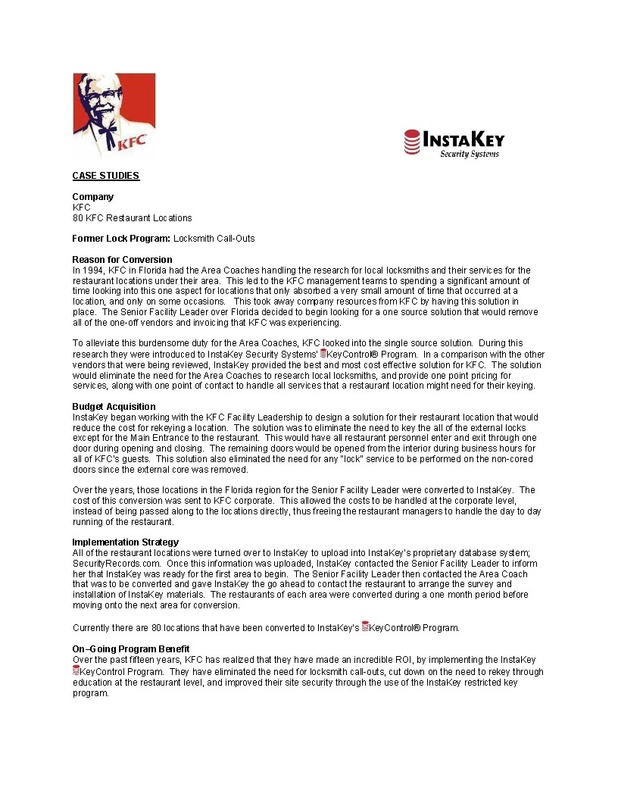 In a comparison with the other vendors that were being reviewed, InstaKey provided the best and most cost effective solution for KFC. The solution would eliminate the need for the Area Coaches to research local locksmiths, and provide one point pricing for services, along with one point of contact to handle all services that a restaurant location might need for their keying.